Disciples Peace Fellowship is proud to partner with The Peace Abbey and their National Registry of Conscientious Objection project. The National Registry for Conscientious Objection was created at The Peace Abbey following the war in the Persian Gulf in early 1991. The National Registry provides men and women of all ages with an opportunity to register their objection to personal, national, and international violence. As a concept, conscientious objection was co-opted by the military who gave itself the power to grant or withhold official status as a “C.O.” The National Registry reclaims the notion of conscientious objection and returns it to its original meaning as a way of life (rather than a military or governmental designation). Conscientious objection is not the property of generals, to be handed out or withheld according to the judgment of draft boards. Objection to violence and courage of conscience are characteristics of a life committed to peace. The National Registry is a national campaign to promote peacemaking as a practical ideal: a way of living in the present that represents our best hope for the future. It seeks to inspire peace and justice in society by inviting peacemakers everywhere to “register” their conscientious objection to violence, and in so doing, to share with others their commitment to a peaceful world. The intent of The National Registry for Conscientious Objection is to emphasize one’s absolute dedication to peaceful living and to the peaceful resolution of conflict. It is only by striving for perfection that we approach perfection. Likewise, it is only by committing ourselves absolutely to peaceful living that peace will, in fact, prevail, in our lives and on the planet. 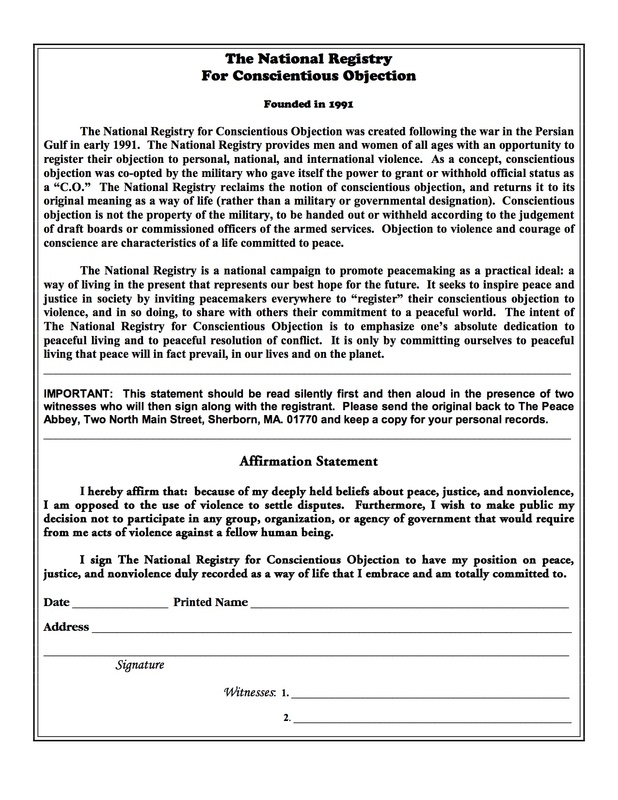 You can print out the National Registry form and send your signed original back to The Peace Abbey, PO BOX 216, Sherborn, MA 01770-0216. You are encouraged to keep a copy for your personal records, perhaps framed and displayed as a sign of your commitment to peace.